C Operators , Operands and Expression are the sets of Element that perform a lot of special task in the C programming. 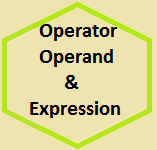 Dear learner in this tutorial i discussed details about of C Operators, operands and Expression . I hope everyone must be benefited form this tutorial. True if both a and b are true. a=5,b=2(a<8 and=”” b=””>1 )thenreturn true. True if both a and b are true. a=8,b=4if (a<9 b=””>3)then return true.